It’s raining today. I made an early trip to the grocery store this morning before things got damp then made myself breakfast: eggs, toast, and fruit. John poured me coffee and I settled into my familiar dent in the couch to soak in the wisdom and wit of Anne Lamott. Her book “Traveling Mercies: Thoughts on Faith,” is one of my favorites to date. One of her best lines came in a chapter on parenting when she found herself struggling to let her then 7-year-old son go paragliding off a big mountain. To fly like “a baby eagle” as she put it. In her indecision she reflected on prayer. I love this. What more can you do besides be open to whatever comes in the morning and then be OK with whatever happened at night? I’m still sitting here, sipping on the coffee as the rain ticks on our big, east-facing windows. Feels like a true Saturday to me, the type you can savor and smile at. I got John to eat chia seeds this morning over his fruit salad. It’s the little victories. He said they looked like “ants” on his oranges and apples, but in the end he didn’t mind. What does this have to do with ice cream sandwiches? Not a lot, but I did read “Traveling Mercies” this morning and I ate an ice cream sandwich last night. Does that count? Also, I ate one a few nights ago while watching “The Biggest Loser.” I’d have felt worse if these weren’t borderline health food. I suppose these just make good lazy activity snacks. They’re vegan, creamy, cappuccino mocha-y. 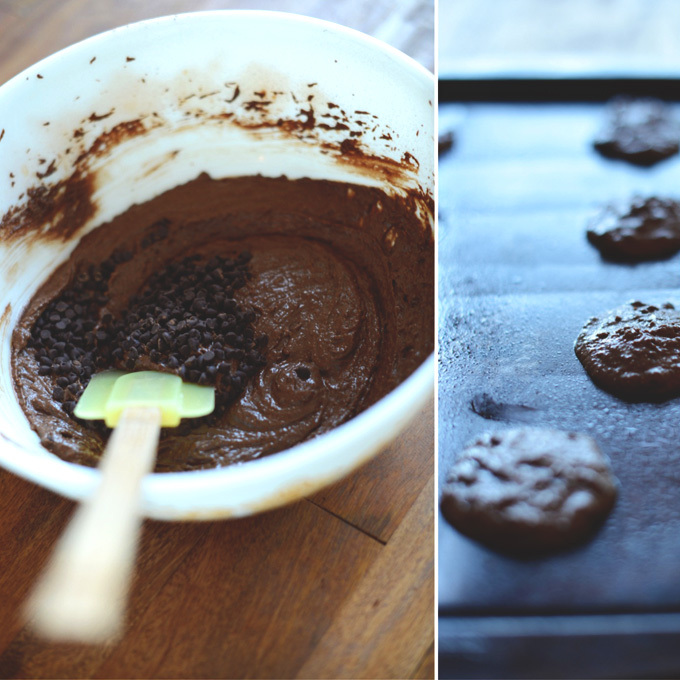 The chocolate “cakies” are made with oat flour, coconut oil and raw sugar. I shared the coconut coffee ice cream earlier in the previous post. They’re overall very simple to make. 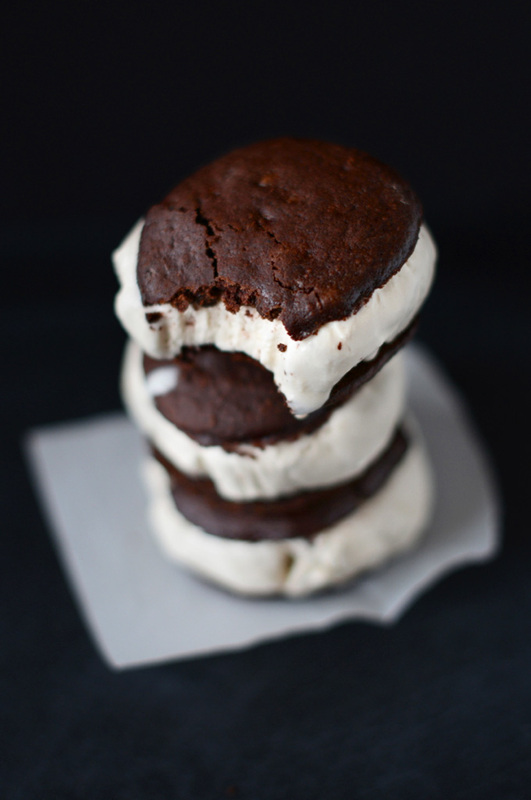 Pillowy vegan ice cream sandwiches made with creamy coconut coffee ice cream sandwiched between two wholesome, fluffy chocolate "cakies." Chocolate, coconut and coffee belong together, I'm convinced. Preheat oven to 350 degrees F (176 C) and lightly coat a baking sheet with non-stick spray. Prepare flax egg by mixing flax and water in a large bowl. Set aside. Measure out almond milk in a liquid measuring cup and add vinegar. Let set for a few minutes. Add the sugar, melted coconut oil and vanilla to the flax egg and beat. Add almond milk and beat again. Add remaining dry ingredients to a sifter and sift over wet ingredients. Beat until well combined. Add chocolate chips and fold in until just combined. Spoon 1 Tbsp measurements of batter onto the greased baking sheet (leaving a small space in between cakies) and spread around and flatten a bit - you don't want mounds, but rather discs. Bake for 10 minutes. Remove from oven, let set on tray for 5 minutes, then carefully transfer to a cooling rack to cool. 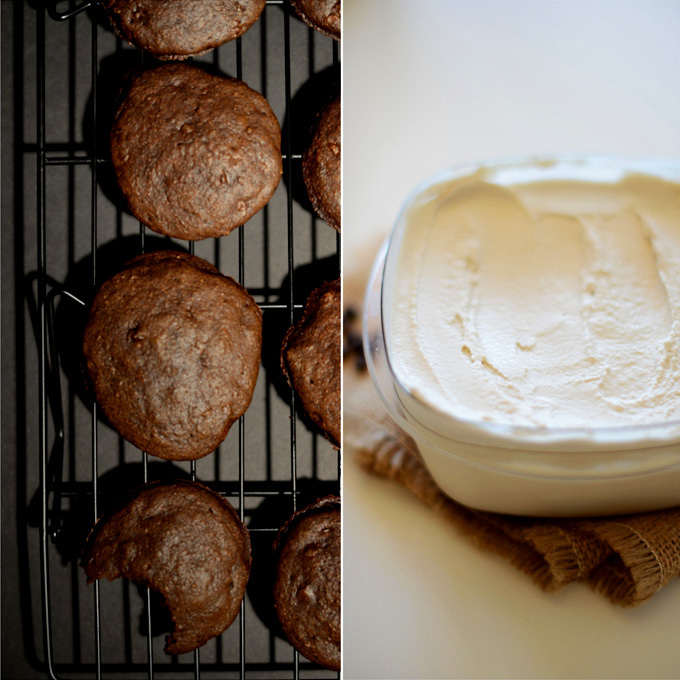 Once cooled, pop cakies in the freezer to harden so they're easier to work with. In the meantime, set your ice cream out so it begins to soften - about 15 minutes. Once soft, use an ice cream scoop to scoop out 8 large balls of ice cream onto squares of plastic wrap (amount as original recipe is written // adjust if altering batch size). Fold the plastic wrap around the balls and squash them into thick discs. Twist off tops to cover and place back in the freezer to harden - about 30 minutes. Once frozen, remove chocolate cakies and the ice cream discs from the freezer and carefully plop the ice cream on the top of one cakey (face down) and then top it with another cakey (face up). (SAVE the plastic wrap). Use both hands to carefully press the cakies together around the ice cream, then place in a baking dish, re-wrap with squares of plastic wrap, cover with a lid and pop back in freezer. Will stay fresh for up to a week. *IMPORTANT: Before eating, either let your sandwich set out for about 15 minutes OR unwrap it and microwave on a plate for 20 seconds. The more frozen it is, the less you can taste its flavors. *These would be excellent dipped in dark chocolate and/or rolled in nuts before serving. Any tips on how to make these grain free? I liked your page while my husband was signed into his Facebook without realizing it. One day he came across your post and I apologized for the mix up. He told me it was ok because he actually likes your posts. He likes your recipes so much he decided to stay subscribed to you on his Facebook account. I’m sure he’ll love this recipe too. What great news! Glad you both found us and enjoy our posts. Hope you find some things you both enjoy! Wow. Just wow – these look so amazing! They are definitely getting bookmarked for making in (hopefully near) future! Yum! I want one of these. Now. pleaaaase! These sandwiches look amazing and really delicious! These look fantastic, Dana. I love that sort of rainy, relaxed Saturday. AND I do always seem to find myself eating something much more indulgent than the norm while watching the Biggest Loser – you’re right though that these are great as far as “indulgences” go. Just copied both recipes. 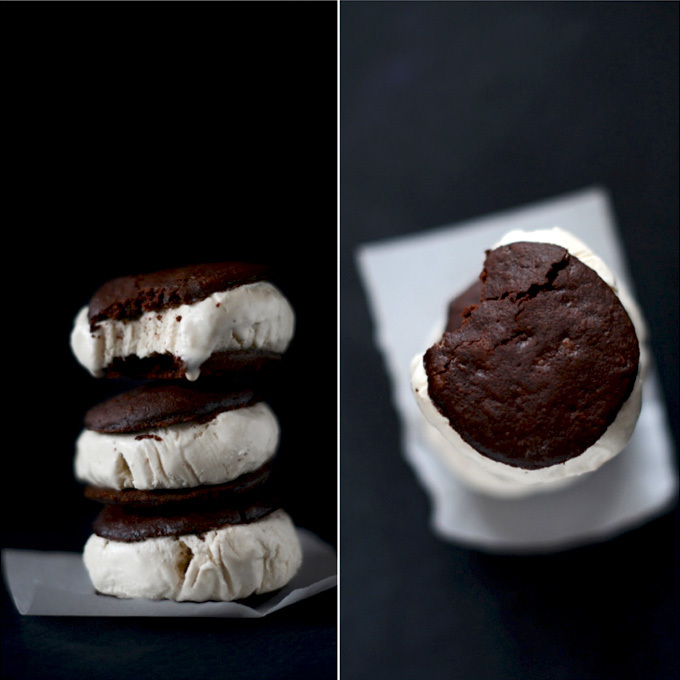 Ice cream sandwiches on the horizon at our house!! Excited for this tasty treat! Thanks! Wow! These look great! I never thought vegan could look so delicious. Very impressive. Oh baby. 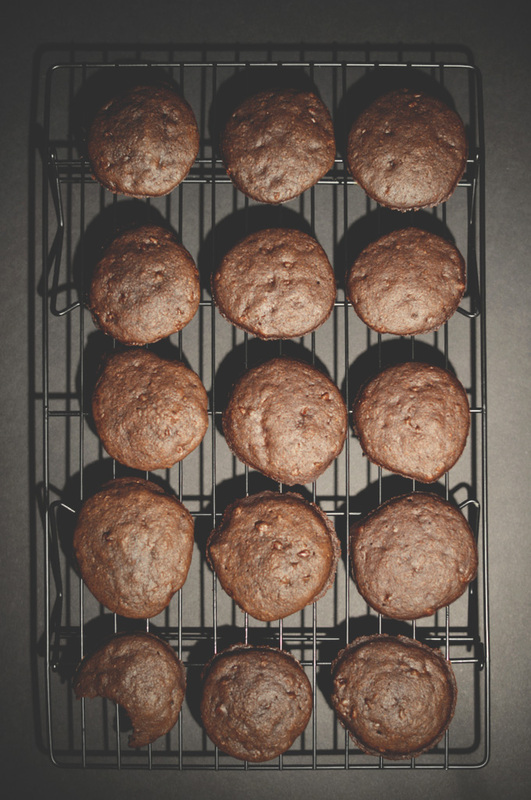 From the looks of things you have absolutely nailed the texture of those cookies! 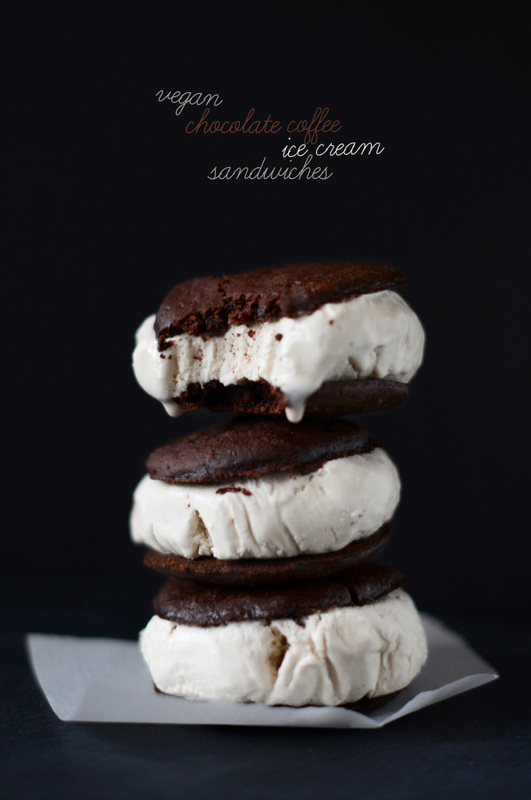 An ice cream sandwich cookie has to be nice and bite-able. These look perfect. Oh my goodness! I have to make these soon & get that book! 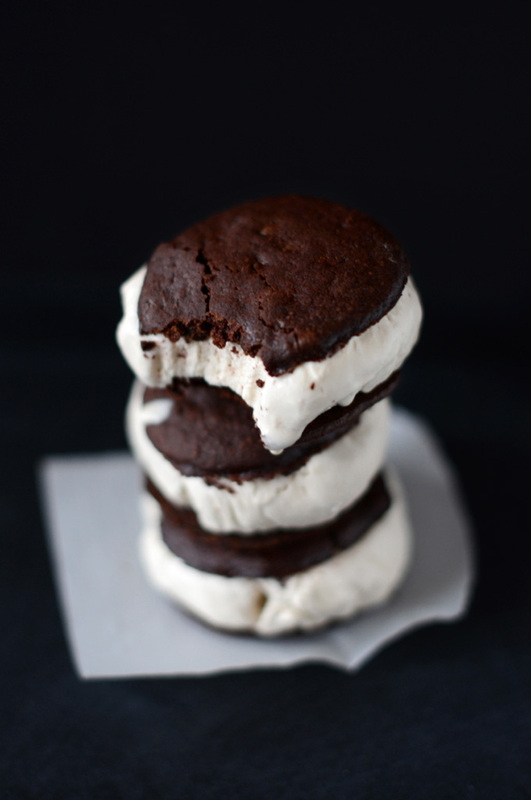 I just used the “cakie” recipe to make vegan whoopie pies filled with coconut frosting. Thanks for inspiring me try a vegan version of one of my favorites. These are amazing! Seriously, seriously swooning over this. Total bliss. How much ice cream do you need to fill the sandwiches? Is it one whole recipe of the coconut coffee ice cream? No, it’s actually only about a third of the ice cream. I still had leftover ice cream, so there’s plenty ice cream for two batches of sandwiches if you’d like!